Service Level Agreement Policy Template with Sample Metrics - Service Level Agreement Policy Template is a nine page policy for a single application, It defines specific SLAs and metrics that are both internally and externally focused. The sample contain over 70 possible metrics presented graphically in PDF format. IT organizations turn to outsourcing in order to reduce costs, to offload applicationmaintenance, offload help desk operations, or obtain expertise. The typical outsourcing engagement is governed by a contract setting the terms and conditions between the client and outsourcer for the duration of their relationship. To measure whether that relationship is working, and how well, Service Level Agreements are established. A Service Level Agreement (SLA) is a critical component of any outsourcing project. It defines the boundaries of the project in terms of the functions and services that the service provider will give to its client, the volume of work that will be accepted and delivered, and acceptance criteria for responsiveness and the quality of deliverables. At the heart of an effective SLA are performance metrics and they are driven by key members of the IT staff. 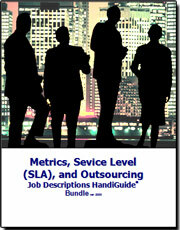 The tasks associated with that are included in the job descriptions in this bundle.